Laminarin from the brown seaweed Laminaria digitata is a linear β(1-3)-glucan with β(1-6)-linkages. Laminarin can act either as a Dectin-1 antagonist or agonist . It can bind to Dectin-1 without stimulating downstream signaling and is able to block binding to Dectin-1 of particulate β(1-3)-glucans, such as zymosan [2-3]. The activity of laminarin on Dectin-1 seems to vary depending on the purity of the laminarin preparation and the Dectin-1 isoform used [1, 4]. 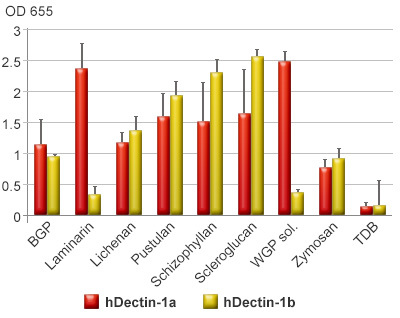 Cells expressing the human Dectin-1b isoform do not respond to laminarin, whereas cells expressing the human Dectin-1a isoform are highly responsive to laminarin . The laminarin preparation provided by InvivoGen contains no detectable levels of endotoxin unlike other commercially available preparations . 1. Smith AJ. et al., 2017. Immunoregulatory Activity of the Natural Product Laminarin Varies Widely as a Result of Its Physical Properties. J Immunol. [Epub ahead of print]. 2. Goodridge HS. et al., 2011. Activation of the innate immune receptor Dectin-1 upon formation of a ‘phagocytic synapse’. Nature. 472(7344):471-5. 3. Rothfuchs AG. et al., 2007. Dectin-1 Interaction with Mycobacterium tuberculosis Leads to Enhanced IL-12p40 Production by Splenic Dendritic Cells. J Immunol. 179(6):3463-71. 4. InvivoGen insight. Summer 2013. Laminarin is shipped at room temperature. 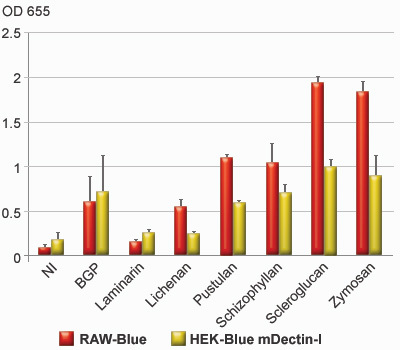 RAW-Blue™ cells and HEK-Blue™ mDectin-1 cells, which express the mouse dectin-1a gene, were stimulated with 100 µg/ml of various β-glucans. After 24h incubation, NF-κB activation was assessed by measuring the levels of SEAP (secreted embryonic alkaline phosphatase) using the QUANTI-Blue™ assay. HEK-Blue™ hDectin-1a and HEK-Blue™ hDectin-1b cells were stimulated with 1 µg/ml or 10 µg/ml Dectin-1 ligands, respectively, and 10 µg/ml TDB. After 24h incubation, Dectin-1-induced NF-κB activation was assessed by measuring the levels of SEAP using the QUANTI-Blue™ assay. Immunoregulatory Activity of the Natural Product Laminarin Varies Widely as a Result of Its Physical Properties. 2017 J Biol Chem. 292(41):16933-16941. Dectin-1 intracellular domain determines species-specific ligand spectrum by modulating receptor sensitivity. 2017 PLoS Negl Trop Dis. 11(3):e0005461. Modulation of the immune response by Fonsecaea pedrosoi morphotypes in the course of experimental chromoblastomycosis and their role on inflammatory response chronicity. The targeted delivery of the c-Src peptide complexed with schizophyllan to macrophages inhibits polymicrobial sepsis and ulcerative colitis in mice. Kim YR, Hwang J, Koh HJ, Jang K, Lee JD, Choi J, Yang CS. 2016 Mol Nutr Food Res. 60(2):458-67. Arabinoxylan activates Dectin-1 and modulates particulate β-glucan-induced Dectin-1 activation.